As promised, here is a fishy tale ready for the end of the merry month of May. As the first of my Journal Quilt pieces I thought I’d start off quite basic, and try to combine a few techniques I’ve used before with one or two I hadn’t. I started off by thinking in design terms of what I was trying to do. I had only just written a father’s day card (a whole month early) and so was thinking of my dad. Those who know him, will know he is a fisherman. Not your blow-the-wind-southerly-fishing-for-a-living type of man, but an avid angler who never seems as happy as when the rod’s in his hand. So fish then. A good theme. I did a little sketch of the sea floor with some seaweed and a few fish swimming by – it was very Finding Nemo. It was also very bad (and I’m not showing you!). So I created a new sketch, trying to turn my somewhat naive seafloor into something more abstract. This is what I came up with. Well it’s a starting point! From paper to fabric then! I started by splitting the design into 4 segments, creating the background of each segment then embellishing individually before appliqueing all together. I made this by doing some simple square patchwork using hand-dyed fabric, so it looked sort of watery. I mixed up the colours to give the impression of sun shining through the water (aaah). White bubbles were then added using the most wonderful Bondaweb – which fuses the fabric onto the top layer. These were satin stiched around the edges to make them look more bubbly. These were actually really easy – as they are essentially flying geese (or should I say flying fish) made by using applique triangles bonded onto the background. This was a good excuse to practice some more free motion quilting in new designs, by leaving the background plain and then quilting the waves ontop. I had thought to add seweed but decided it looked a bit naff. Ok, so I really cheated here and just used patterned rock fabric. Well wouldn’t you if you had some perfect sea-floor rock fabric just lying around? 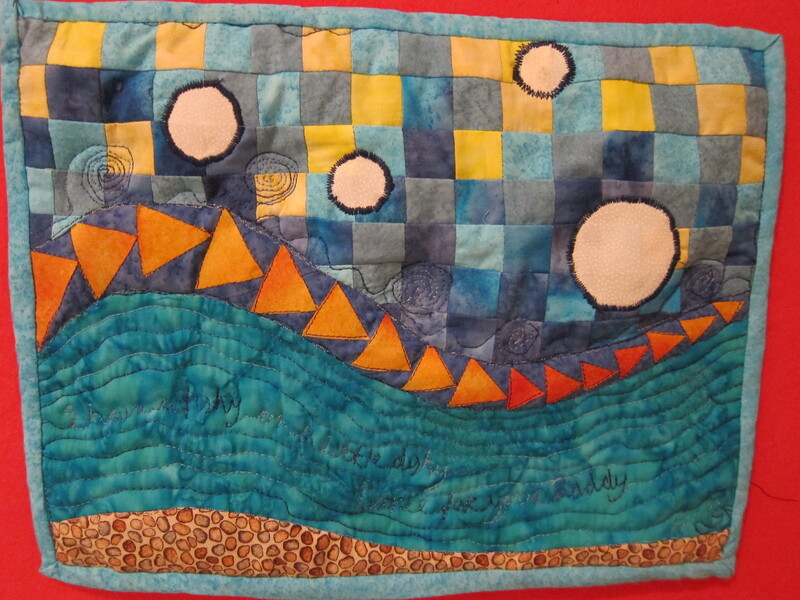 This entry was posted in Uncategorized and tagged applique, fish, Journal Quilt Challenge, Quilting on 31 May,2012 by antalbot.